If you were young and single in 1987 you might remember how “paired off” the dating scene was (especially in the Boston clubs). I remember it seeming like everyone was trying to find someone to share their musical lifestyle with, someone that they could be “seen” with. You had your hair-metal crowd, punks, Dead-heads and of course – Cure-kids. No other time in history, would a single guy be so willing to wax his hair into a gravity defying hedge, wear guy-liner and even nail polish to get a piece of …the action. Punk chicks were usually pretty tough, metal-babes were mostly intimidating, there could be a road trip involved if you set your sites on a hippie girl, but Cure girls were looking for a sensitive guy to “understand” them and if you looked the part (even for an evening)…your chances were pretty good. If you were willing to “Cure” out your look, it “said” that you were “seCure” as a dude and sensitive to boot. Special thanks to Robert Smith for providing a simple template. 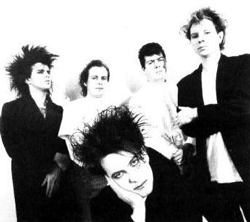 All of this cultural stuff aside…The Cure made great music. They romanticized emotional hardship in a dreamy, dark and damn catchy package. The hair bands of L.A. Seemed so mainstream compared to the brooding, modulating sounds from this European “alternative”. Yep, I said it…”that” word. With the release of their seventh album, 1987’s “Kiss Me Kiss Me Kiss Me”, they finally managed to break through to the U.S. top 40 Billboard chart (with their seventh album! )…The production was slick for sure…with big gated reverbs, chorus and flanged guitars basses and more…but it was Robert Smith’s brooding vocal delivery and journalistic lyrics that set it apart from all of the U.S. chart-busters. This week, we investigated the sonic formula that makes up this pioneer of the alternative sound. The Drums: The 80’s brought the advent of the “power tom” to fashion. That meant that toms (kicks too) became deeper (as a norm). Your typical twelve-inch tom was 8 inches deep as opposed to the power tom, which was usually more like 10″ deep. Kick drums were also being produced in power-depth. This contributed to more of an open sound…less muffled. The China- cymbal also played a big part in the sound of the Cure’s drum sound in the late 80s. 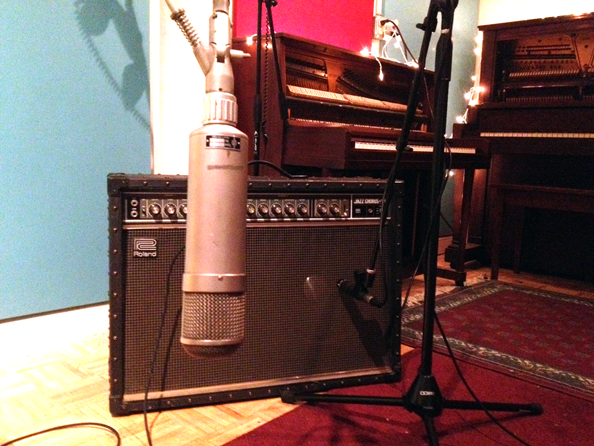 Gated reverb was also in fashion, and we had fun re-creating the reverb (especially the snare). Acoustic kits were also being mixed with trigger pads, further integrating the drum machines of the time with the acoustic drums. We triggered a Yamaha RX21 snare drum (using an old-fashioned sample/trigger patch in the SPX90) but only sent that signal to the reverb. This is a trick of the trade for creating consistency of the snare drum hits to the effects. The Bass: ’72 P-Bass into an Ampeg SVT played with a pick. 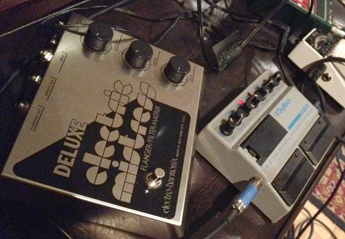 We tried a handful of chorus and flanger pedals and ended up using a Digitech PDS 1700 Chorus/flagger pedal from the 80s…a relatively unlikely choice, but there was no denying the likeness to the Cure’s bass sound when we hooked it up. We mixed a direct signal (no effects) at about 80% of the volume of the amp signal during the mixdown.The Guitars: One of the most identifiable sounds of the Cure is Robert Smith’s 12-string acoustic/electric guitar plugged into a Roland JC-120 guitar amplifier. I found documentation online of the microphones that were used and re-created the scenario with a Shure SM-57 on one speaker cone (positioned very close) and a Neumann U47 positioned a few feet back from the other cone…this worked out great for us. For the electric guitar, we used a ’67 Gretsch Nashville semi-hollow guitar. In the middle pickup position into an Electric Mistress pedal. We auditioned a Memory Man Chorus as well, but ended up using the Mistress. We used a Vox AC-30 amp set pretty clean (not loud enough to distort), and put a compressor pedal (MXR Dynacomp) in the chain to give us a little sustain. 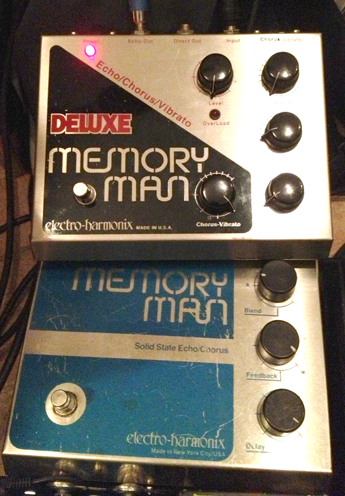 We used a Memory Man Deluxe to add a long delay as well. In addit ion to this guitar, we also used a baritone guitar…Robert Smith has a 60’s Bass VI that is rumored to sound amazing…we had a Fender Baritone special. This guitar was used as a subtle low note accent throughout the track. This texture (albeit sparse) is a big part of the sound. An additional clean guitar was tracked with the Gretsch as a rhythm part, that switched between playing arpeggios and strumming. 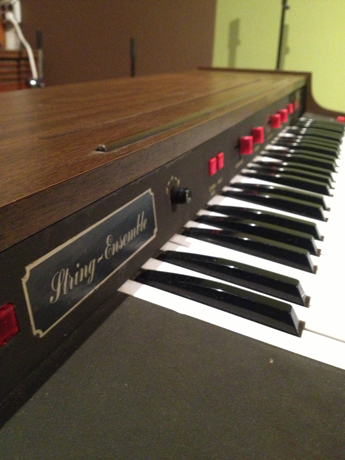 We used the 70’s Memory Man Chorus for a bit of modulation on that one.The Keys: The “Solina String Ensemble” keyboard played a prominent role in the Cure’s sound…think “Just Like Heaven”. Also heard on non-Cure songs like “Dream Weaver”, songs from the Bee Gees, ABBA and more…this bright and somewhat “cheesy” synthesized string sound seemed to balance out the darkness …helping the listener to meet somewhere in the middle perhaps (?). We also used a sample of an acoustic piano that we heavily compressed, put a dotted eighth-note delay and some reverb on to re-create a sound like “Just Like heaven”.The Vocals: We used a Neumann U47 microphone and compressed with an 1176 at 4:1 ratio at about minus 6dB of gain reduction. At mixdown, we brightened it up quite a bit, de-essed – with two de-essers the first in the chain set to broadband and the second more narrow and compressed again with a Gates Sta-Level. It’s pointless (in my opinion) to think that I could make Aaron’s voice sound like Smith’s, but I did replicate the very short delay with an Echoplex EP-3 as well as a micropitchshift and slap delay from the Eventide H3000. At the end of the day, my goal was to get the vocal to occupy a similar space in the mix as Robert’s might have. I added a harmony vocal, tripled it in the chorus, and doubled in the outro. With a little Eventide, and plate reverb I quickly set them underneath the lead. Forgive the “doot” response vocal part in the outro…a clear homage to a much later Cure song – I couldn’t resist (ha-ha). Anyway, this week went by fast! Check out the video below, and as always…feel free to download a hi-res audio file below! Tuesday Night Recording Club – Other Side Of Love – July 2, 2013 from Tuesday Night Recording Club on Vimeo.